Staff from the National Police and Patrol Police of Ukraine spent last week in Luxembourg putting together the pieces of a communications strategy, thanks to a joint initiative of EUAM and the Luxembourg government. The Ukrainian delegation used the offices of the Luxembourg Police to brainstorm, step by step, the various components of a communications strategy – from identification of target audiences, to key messages and communications tools. The National Police and Patrol Police are eager to strengthen their communications capacity and develop “one police voice”. This is especially important given that both entities, created towards the end of 2015, are undergoing significant reforms that need to be communicated to the Ukrainian public. 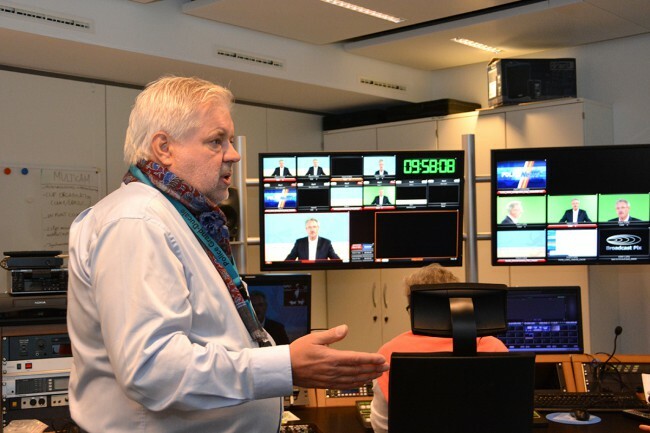 The delegation were also able to use the ultra-modern Luxembourg Police recording studios in order to practise simulated press briefings and press conferences, during which the Luxembourg Minister for Foreign Affairs, Mr Jean Asselborn, greeted them. “Our country desperately needs reforms. Ukrainians want changes and renewal of the whole system of the state agencies. And we face challenging task not only to reform old structures, but also timely to inform society about those changes, that have already happened, and about further actions. People want to know what is happening. We must be transparent and open to regain public trust to the state agencies. Under such conditions matter of public communications becomes a priority. Currently, National police, established few months ago, is developing its communication strategy. Our counterparts from EUAM and Police Grand Ducal of Luxembourg are helping our experts to use best European practices and take into account national specifics,” said the Head of the National Police of Ukraine, Khatia Dekanoidze. “There is no better way of sharing best practices in public communication than for our Ukrainian partners to observe first-hand how a modern European police force conducts its work,” said Ronan Goggin, EUAM Head of Press and Public Information. “The National Police and Patrol Police are very ambitious and EUAM is ready to help in any way we can”.